You can use the negative space of one card to make another card, which is exactly what I decided to do. 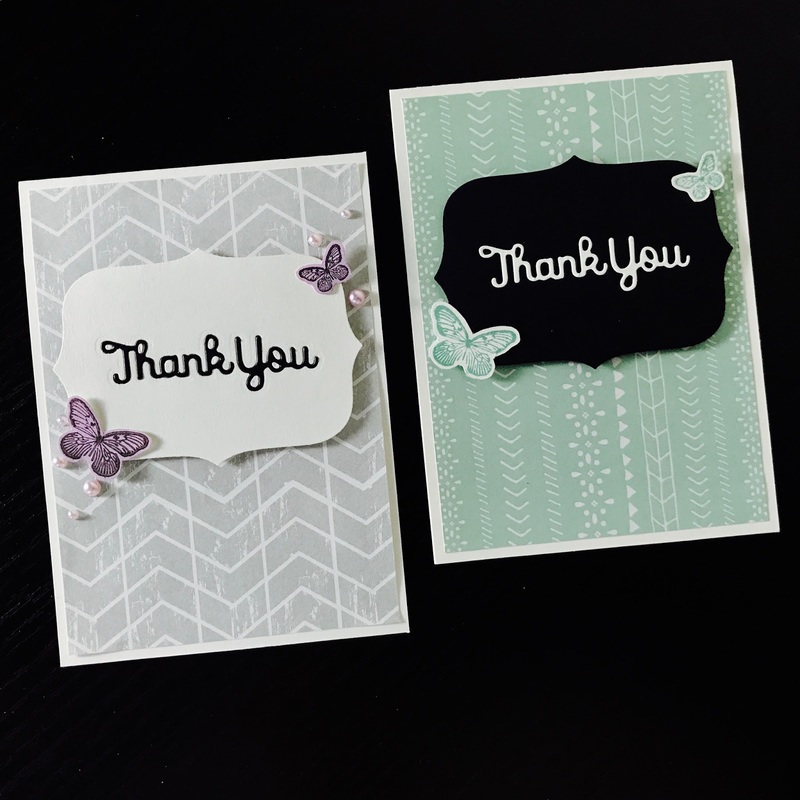 I used a 5.5 x 4 inch white top folding note card for the base of both cards. Using a patterned paper of your choice, cut it down to 5 1/4 x 3 3/4 inch piece and adhere it to the front. I used a piece of paper from a paper pad I bought from the reject shop. Yes, the reject shop. They have a few paper pads by 'The Craft Stall' that have some very pretty patterns. For the sentiment I first die-cut a frame from both white and black card stock using a project life die. Then I die-cut the 'Thank you' from the middle of these frames; make sure not lose any of the pieces. Tip: to make sure you don't lose any of the small pieces push out your die cut onto the sticky side of a sticky note, this keeps the pieces together. Now for the die-cut inlay technique. Add some double sided tape to the back of each frame, the sticky side should show through the place you die cut the sentiment. There are three parts to this, the frame, the 'Thank you' die-cut and the leftover pieces. For the white frame you need to stick in the black die-cut and the white leftover pieces to fill in the space and vice-versa for the black frame. I decided to put some craft foam behind the frames to add a bit of dimension. For the card with the black frame I stamped the butterflies on some white card stock with a dye ink that matched the background (I actually used a distress ink). 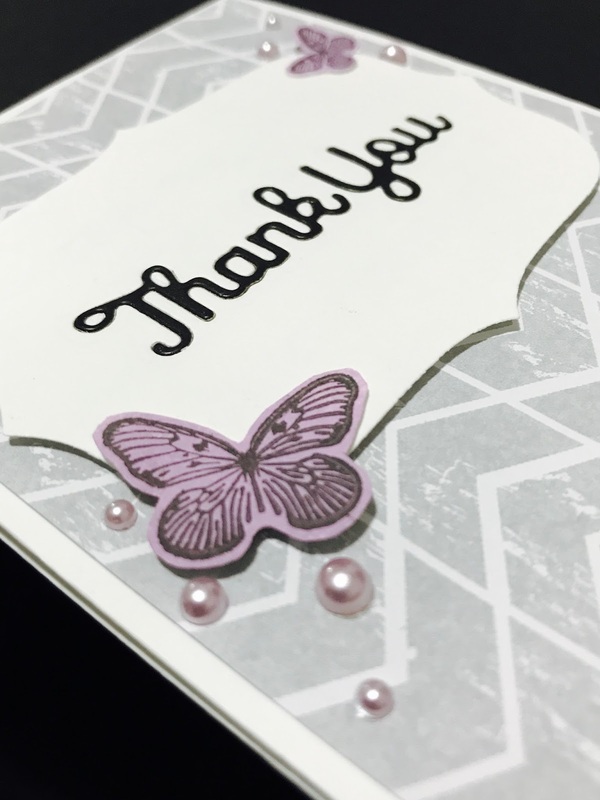 For the card with the white frame I stamped some black butterflies on white cardstock that I covered with a purple-pink pigment ink, I also added some pearls to finish, (I just couldn't resist)! Alternative technique: Instead of using dies you could stamp the sentiments using white and black pigment ink (although you will most likely need to stamp the white several times to give a solid colour over black cardstock). 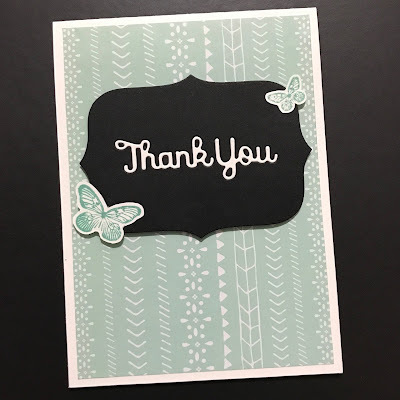 Everyone likes to know that they are appreciated and sometimes a card just saying thank you can make someone's day! Remember it's always a plus to give and receive a handmade card. Happy papercrafting!